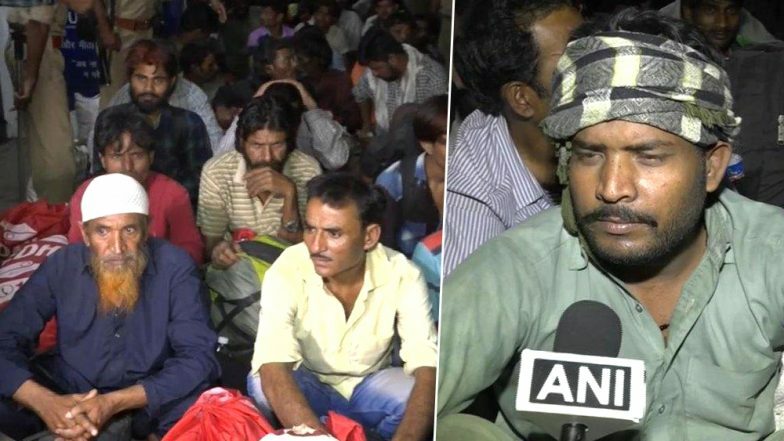 Vododara, April 12: As many as 100 Indian fishermen, who were released by Pakistan earlier this week, arrived in Gujarat from Amritsar on Friday. The fishermen were holed up in Pakistani jail for crossing the international sea borders. Reports inform that they arrived in Punjab first after being released through Attari-Wagah border earlier this week and were then brought to Vadodara through train by the state fisheries department. These fishermen are from the state's Veraval region and were caught by Pakistan coast guard on the international sea border. Reports inform that they were kept in Karachi jail for over one and a half year before being released on April 8. According to reports, all of them crossed over to India in the evening on the basis of ’emergency travel certificate’ issued by the Indian High Commission in Islamabad, officials said. Pakistan Announces Release of 360 Indian Prisoners Upon Completion of Their Sentences. Ramesh Kumar, Assistant Director, Fisheries Department informed that the fishermen were released from Pakistan on April 8 and a team from India had gone to Amritsar to receive them and have brought them to India in a train. According to a tweet by ANI, one of the released fishermen, V Babu said that all of them were kept in a cell and were not allowed to move freely. "We were kept in a room & not allowed to move freely during recent period of tension between the two nations," Babu said. Pakistan Could Be Blacklisted by FATF Due to 'Lobbying by India', Says Shah Mahmood Qureshi. Meanwhile, another fishermen said many of them accidentally cross the border while some go to that side knowingly for catching fishes. "I was in Pakistan for about 17 months. We were always confined in a particular cell and were never allowed to venture out. We were clearly told to stay in the definite cell for our own safety", he added. A fishermen named Vikram was quoted saying by ANI that they were caught accidentally while they were sleeping on over boat and the boat had accidentally crossed inside their border. Earlier this month on April 5, Pakistan had announced that it will be releasing 360 Indian prisoners upon completion of their sentences, starting April 8. The decision comes after India sent a note verbale to Pakistan urging it to make necessary arrangements for an immediate release and repatriation of Indian prisoners who had completed their respective prison sentences.